In magazines and music press releases from the first half of the 1950s, The Peggy Lee Show was a moniker informally assigned to not one but two series hosted by the vocalist. The earliest of the two was broadcast in 1951, the other one for most of 1952. Due to a variety of reasons, the second series can be deemed a continuation of the first,. The same network broadcasted both sets of shows. 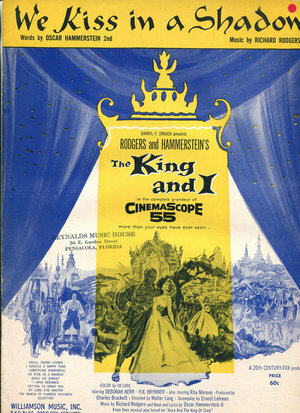 During the first four months of its full span, the 1952 series featured the same producer and musical accompaniment as its 1951 predecessor. Hence I will be discussing them together at times, even if I have ultimately chosen to dedicate separate pages to them -- lest a full dual discussion proves too much of an information overload for the reader. The present page is circumscribed to the episodes from the 1951 series: a summer installment officially known as The Peggy Lee Rexall Show. Informal titles by which it was also known included A Date With Peggy Lee and, as already mentioned, The Peggy Lee Show. Readers looking for general details (e.g., scheduling, format, personnel) should scroll down to the bottom of this page, where general notes about this two-months-long program can be found. For indexes of the songs that Lee performed and the guests for whom she hosted in this 1951 program, go to the bottom of the page dedicated to the second radio series. During the debut episode of The Peggy Lee Rexall Show, the hostess welcomed not one but two guests: fellow singer Mel Tormé and fellow songwriter Walter Kent. At the time, Peggy Lee and Mel Tormé were enjoying a solid professional partnership. Working under their respective Capitol contracts, they had joined forces to record four duets together (1949-1951), including two on which they further collaborated as songwriters. Capitol had released the four titles on two singles, and one of the numbers ("The Old Master Painter") had reached the top ten of the music charts. 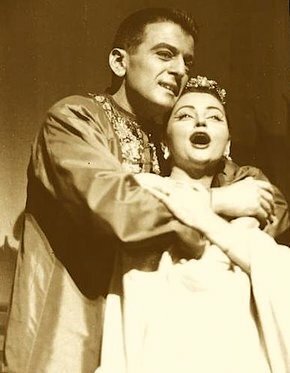 In 1949, Lee had also made a pseudonymous appearance in Tormé's album version of his California Suite, play-singing the role of the antagonist to the suite's other characters. (California Suite holds the distinction of being Capitol's first non-classical 12" vinyl.) One of the other Lee-Tormé duets, "Bless You," would enjoy a brief revival in 2013, after having been featured in Gangster Squad, an impressively stylized but financially unsuccessful neo-noir caper. An architect by trade who also undertook violin studies at Julliard and briefly led his own orchestra, Walter Kent had his greatest success as the composer of two wartime hits, "I'll Be Home For Christmas" and "(There'll Be Bluebirds Over) The White Cliffs of Dover." He also had a minor chart hit with "When The Roses Bloom Again," thanks to a version recorded by Jimmy Dorsey & His Orchestra, featuring crooner Bob Eberly. (A competing record was made by The Benny Goodman Orchestra, with no other than canary Peggy Lee.) During the same period, Kent also found steady work and a measure of success as a Hollywood film songwriter. In fact, he enjoyed two back-to-back Oscar nominations, both for songs from minor musical films ("Too Much In Love," featured in Song Of The Open Road, 1946; and, from 1947, the Endlessly theme). 1. Peggy's Preview: "After All, It's Spring"
According to a review published by the trade periodical Variety, each episode of Lee's 1951 summer show was slated to include a segment named Peggy's Preview, in which she planned to introduce a brand new song. "After All, It's Spring" launched her plan. The number came from the musical Seventeen, which back then was about to open on Broadway (June 21, 1951). 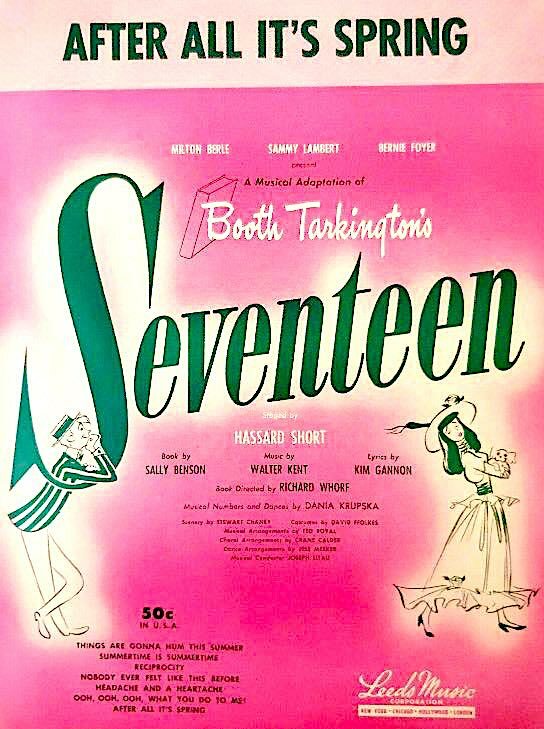 The Broadway show was based on Booth Tarkington's novel Seventeen: A Tale of Youth And Summer Time And The Baxter Family - Especially William, whose initial outing took the form of monthly installments published from 1914 to 1916 in the New York-based magazine Metropolitan. Attesting to the long-standing popularity of Tarkington's opus were the multiple adaptions for cinema, radio, and theatre that followed its 1916 publication in book form. Featuring a score written by the aforementioned Walter Kent with his then-current collaborator, lyricist Kim Gannon, the 1951 theatrical edition ran for 182 performances, closing on November 24, 1951. As far as I know, it has not been revived, but the score had the privilege of being recorded for commercial issue on the RCA Victor label. That issue's front cover is pictured above. Peggy Lee made several contributions toward the goal of keeping the score's best number alive. For starters, she had sung the number a few days in advance of Seventeen's debut on Broadway. As if that were not enough, Lee also recruited the song's composer to appear as one of her guests in this debut episode of her show. The episode's dialogue has not been preserved, but it is reasonable to assumed that the hostess and her guest made comments about the song and the show from which it came. Lee went on to reprise "After All, It's Spring" in a later episode (June 29, 1951), too. Unfortunately, the song did not find much favor afterwards, never becoming a standard. But it did enjoy at least two trips to the recording studio, once on a date with singer Teddi King in 1957 (for her RCA Victor album A Girl And Her Songs), the other time on a 1988 session with vocalist Daryl Sherman, who sang it for the Audiophile album Getting Some Fun Out Of Life. 3. "It Never Happen'd To Me"
On the specific matter of song listings, this page's main source is a log of The Peggy Lee Show which the Library of Congress created, after consulting its own holdings. It should be noted that the library's holdings do not contain the original 1951 CBS broadcasts, but edited versions of them that the American Forces Radio prepared for use on its network, in 1953. It is for that reason that the LOC misses two songs that Lee sang during the CBS broadcast ("Mañana," "It Never Happen'd To Me"). Most probably, the two songs were excluded from the AFRS version of the show due to time constraints. The Peggy Lee Show that AFRS beamed from its stations was scheduled to last 15 minutes, whereas the CBS episodes of The Peggy Lee Rexall Show ran for 30 minutes. The source from which I learned about the two additional songs is the aforementioned Variety review of the episode. The Variety reviewer makes it clear that he listened to the original broadcast as it aired on the CBS network. Since the full CBS roadast does not seem to be extant, I cannot ascertain if the show featured additional Lee performances, left unmentioned in the review (and left out by AFRS). As previously explained, the American Forces Radio Service prepared and sent to its participating stations an edited version of this original CBS episode. Making it part of a series which the AFRS called The Peggy Lee Show, the episode was edited down from 30 to 15 minutes. The shortened amount of time allowed for the inclusion of the following five numbers: "All of Me," "Too Late Now," "We Kiss In A Shadow" (Tormé), "After All, It's Spring," and "Mr. And Mississippi" (Tormé). 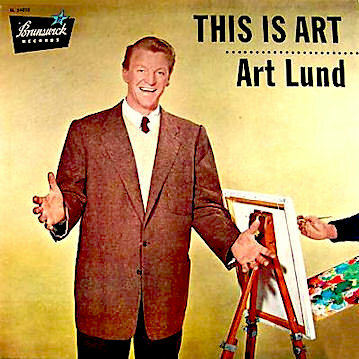 The second episode of The Peggy Lee Rexall Show counted with the presence of Art Lund, a fellow vocalist and actor who also did professional work under his actual name, Art(hur) London. Lee and Lund knew one another well. They had recorded a couple of duets and shared many concert dates during the years 1941 and 1942, when the pair had fulfilled the roles of boy and girl vocalists within The Benny Goodman Orchestra. Drafted for service at the Navy, London had had no choice but to leave Goodman's ensemble in May of 1942. But, after his wartime duty was over (November 1945), he promptly returned to the fold. Meanwhile, during his absence, Lee had married and quit the band; she had also been making waves as a solo artist. Five years later, this episode of The Peggy Lee Rexall Show served as the occasion for another reunion, further cementing the professional partnership of Goodman's former vocalists. Unfortunately, we do not know if the present gathering resulted in any additional duets. Two months later, Lee an Lund would cross paths on TV when both appeared in an episode of The Ken Murray Show, but the numbers sung by either artist in that episode are, once again, unknown. Worse yet, we count with no additional data about the show -- not even the titles of the songs that were performed by Lee. 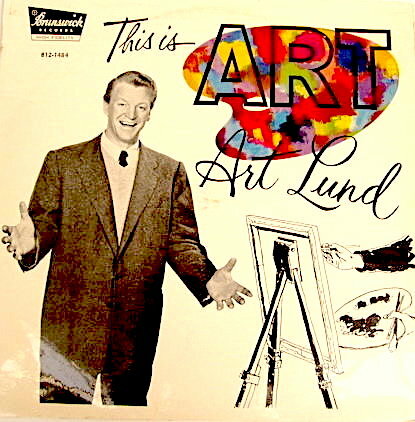 Much more could be said about the long career of Art Lund/London, especially in the worlds of television and theater. For the purposes of this Peggy Lee-centered discussion, suffice it to mention Lund's high-profile role in the Broadway musical The Most Happy Fella (1956). As the actor who originally played that production's role of Joe, he premiered the song "Joey, Joey, Joey." His old partner Peggy Lee would record "Joey, Joey, Joey" for Decca Records that same year, placing it in Billboard's Top 100 chart. 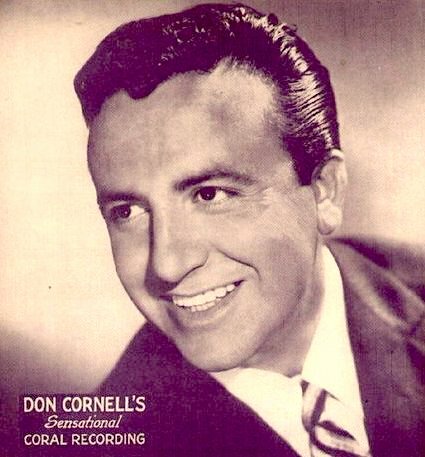 This episode's guest was Don Cornell, a big-voiced vocalist whose popularity remained steady for a 13-year period (1942-1955), during which he picked up well over 30 top forty hits. 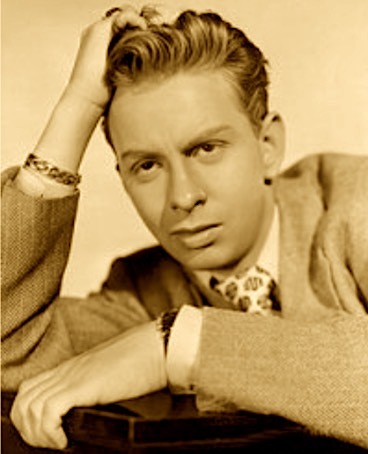 The 1940s portion of his catalogue was co-shared with Sammy Kaye, for whose orchestra Cornell served as boy vocalist. The Kaye-Cornell hits included "I Left My Heart At The Stagedoor Canteen," "That's My Desire," "Careless Hands," and "Room Full of Roses," all of which placed within the top three of Billboard's main music chart. Among the successes of Cornell's ensuing solo career (in the 1950s) were "Heart Of My Heart" (a trio with Alan Dale and Johnny Desmond, both of whom would guest in Lee's show as well), "I'll Walk Alone" and, in 1954, "Hold My Hand," his highest USA peak (#2). While visiting The Peggy Lee Show, the Italian-school baritone chose to croon "How High The Moon." 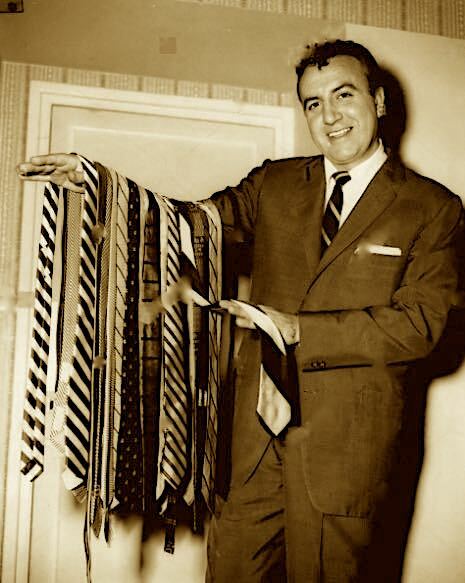 Dating from around 1956, the first of the two above-seen photos shows Cornell as he proudly displays his collection of more than 300 ties. The second photo is an undated publicity shot, which was often recycled as the front cover of sheet music pieces featuring Cornell's hit numbers. 1. Peggy's Preview: "Something Wonderful"
The songs listed under this date were those which the AFR Service picked for inclusion in its own edited version of the CBS episode. The original CBS broadcast is likely to have featured additional numbers. A longer explanation for this somewhat confusing matter is provided immediately below. This episode once existed in two versions: the original CBS broadcast (1951) and an edited version, put together by the American Forces Radio Services (1953). The latter was prepared for the express purpose of syndicated broadcasting through the Armed Forces’ network of participating stations, as part of a series which AFRS called The Peggy Lee Show on the air -- and more simply, Peggy Lee on AFRS disc's labels. As part of its conversion of the half-an-hour CBS episode into its 1953 version, AFRS edited the 1951 original to 15 minutes, which allowed for the inclusion of the following five numbers only: "Shanghai," "Try A Little Tenderness," "How High The Moon" (Cornell), "Something Wonderful," and "That Old Black Magic." To my knowledge, only this edited version of the episode has survived -- not the original CBS broadcast. 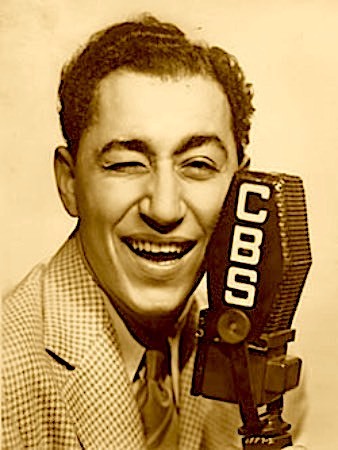 Bandleader, trumpeter, songwriter and singer Louis Prima guest-starred in the fourth episode of Peggy Lee's summer series. Making a total of five appearances, Prima would turn out to be Lee's most frequent guest (vocal groups excluded). All his appearances but this one would fall within the later, 1952 edition of the show (broadcasts dated March 25, March 27, April 10, and April 24, 1952). The first face-to-face encounter between Lee and Prima might have been the one that had happened just a few months earlier, when Prima's band had accompanied Lee at a Capitol recording session (February 8, 1951). During that date, she even covered one of the man's compositions ("Yeah, Yeah, Yeah"). By 1951, Louis Prima was a very well-established figure in the music business, mainly in his capacity as leader of a big band ensemble that had remained active for more than 15 years. Stylistically, Dixieland music had been the bandleader's primary focus during the earlier years, with swing becoming increasingly prevalent as time went by. In addition to leading, playing trumpet and singing in his own band, the so-called King of Swingers had written one of the definitive songs of the swing era ("Sing, Sing, Sing") and had, toward the era's end, co-written a bona fide pop standard ("A Sunday Kind Of Love"). From 1935 to 1947, Prima's steady presence in the world of popular music had been further proven through his placement of eight songs in the charts, half of them within the top 10. 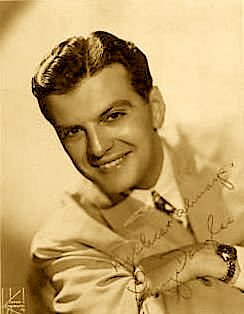 His popularity as a bandleader and recording artist was also made evident through the fair share of labels (most of them well-known ones) which signed Prima's band between 1935 and 1951: Brunswick, Decca, Varsity, Hit, Majestic Vocalion, RCA Victor, Mercury, Prima's own Robin Hood and, in late 1951, Columbia. Despite such major achievements, the peak of Prima's fame was still waiting around the corner. From the mid-1950s onwards, his act The Wildest Show In Town would become one of the hottest tickets in the hotel/nightclub circuit. (In addition to the band, the act featured Sam Butera And The Witnesses and Prima's then-wife Keely Smith.) Concurrently, the group's recordings for Capitol -- made while Lee also happened to be recording for the label -- would fully cement the bandleader's reputation as a top act of the Las Vegas circuit and post-swing era. Regrettably, there are no indications that the present CBS episode is extant, nor is there any evidence of a AFRS re-broadcast. The titles of the songs performed during the half hour remain unknown. 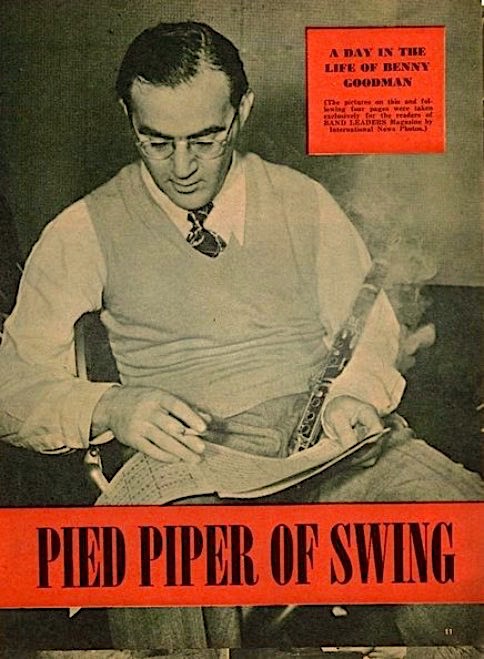 From the King of Swingers to the King of Swing: following Louis Prima's visit, Peggy Lee enrolled her former boss, bandleader Benny Goodman, to royally serve as the fifth guest of her show. Lee had worked as the female vocalist of The Benny Goodman Orchestra from 1941 to 1943, going on live dates with the band day after day, and recording over 30 masters for Columbia Records before her March 1943 departure. In 1944, Goodman and Lee would separately record numbers that became part of Capitol's vaults (in his case, a couple of songs for the soundtrack of the Walt Disney movie Make Mine Music; in her case, a couple of songs for critic Dave Dexter's album project New American Jazz). Those sides were the beginning of her very long association with the label. In 1947, after Goodman's official jump from Columbia to Capitol, he and Lee joined forces for a handful of additional recordings, including one that became a chart hit ("For Every Man There's A Woman"). But their professional collaboration was not limited to the recording studios at this time. Away from Capitol's premises, they further worked together in at least one concert series (1946). 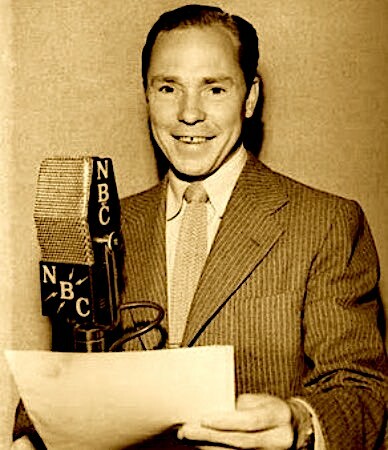 Furthermore, Lee guest-starred in an episode of Goodman's own radio show (1946). Five years later, Goodman returned that favor by making the appearance under scrutiny. In addition to accompanying Peggy Lee during a rendition of the catchy and then-new novelty tune "Toodle-Ee-Yoo-Doo," the clarinetist graced this program with two solos: "Clarinade" and "Goodbye." (Another reunion had happened earlier this year. In March of 1951, they had appeared on TV together, along with Mel Tormé, in the premiere of a music variety series. More reunions would ensue over the decades, including a 1965 joint concert bill and a 1982 Kennedy Center Honors ceremony, in which honoree Goodman was regaled with a Lee performance of their hit "When Or When." ) For other specifics about Goodman and Lee's work together, consult this sessionography's Goodman section, along with the pages dedicated to their concerts, studio and radio releases. The sources for the timings found next to the above-listed performances are the relevant releases from the labels Sounds Rare and Jasmine. In such releases, nearly all the tracks contain dialogue, which both Sounds Rare and Jasmine count as part of the given song's timing. In this episode's installment of Peggy's Preview, Peggy Lee and Benny Goodman acquainted radio audiences with "Toodle-Ee-Yoo-Doo," a ditty that had been written by Goodman's then-current girl vocalist, Nancy Reed, and which his band had recently recorded. Although never attaining widespread fame as a vocalist, Nancy Reed did go on to record her own album for Atlantic Records in 1986, using the same talented musicians (Grady Tate, Mike Renzi, Jay Leonhart, etc.) that would become members of Peggy Lee's regular music group during her later years. 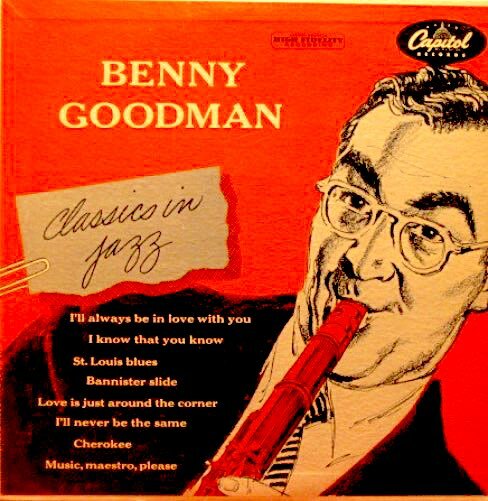 From the audio of this episode's dialogue, it transpires that Benny Goodman had momentarily borrowed Russ Case's clarinet to perform in this show. The earliest commercial issue of this CBS broadcast came out on the Sounds Rare label, whose owner(s) probably had access to numerous types of rare radio material. I cannot vouch for the current existence of the CBS lacquer disc from which Sounds Rare transferred this episode. On the contrary, I would not be surprised to learn that it no longer exists. One of my policies for this and many other pages of the Peggy Lee discography has been to enter only issues that I know or believe to be extant. The exception made on this particular case aims at clarifying the original source of this radio material, which nowadays has become amply disseminated through Public Domain CDs and MP3 files. Not having ever seen the lacquer disc that contained the episode under discussion, I do not know which details were printed or penciled on its physical label. Such lack of information posed a challenge during the process of entering the details that this discographical database requires in order to incorporate any given issue. I have resorted to incorporation a couple of details which, though relying on my general familiarity with the radio material under discussion, are still of my own creation: namely, the above-given title (“Peggy Lee Rexall Show”) and program number (“5”). 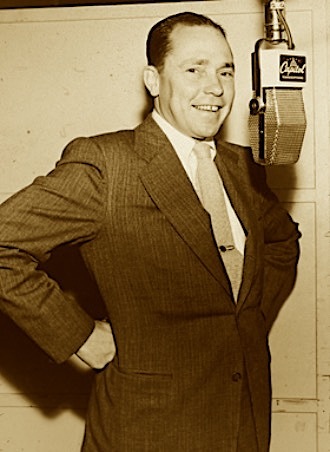 The guest for this installment of The Peggy Lee Rexall Show was Johnny Mercer, the legendary lyricist who was also a co-founder of Capitol Records, the label to which Peggy Lee was signed for the bulk of her lengthy musical career. The photos on this session catch the lyricist-vocalist in the process of mastering four microphones from three different labels -- one of them being, of course, Capitol. Like most other interpreters of standards, Peggy Lee sang many of Mercer's lyrics during her career -- in her case, about 30 -- and recorded quite a few of them, too. When it came to songwriting matters, she considered the man her mentor. Lee's 1951-1952 radio venture attests to her admiration for the renowned lyricist: during the months that she spent hosting the show, the songstress performed about a dozen of Mercer's lyrics. Her enthusiasm for Mercer's work was not limited to these 1951-1952 shows, though. She had already welcomed him as her guest in two episodes of a radio series that she had previously hosted (The Chesterfield Supper Club). 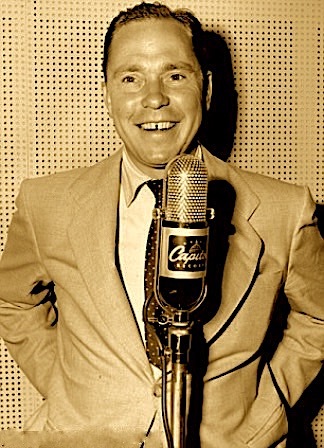 After this appearance on The Peggy Lee Rexall Show, Mercer would further accept Lee's invitation to appear as guest in her ensuing radio series, Club 88 Oldsmobile Show. Counting that episode (broadcast on May 27, 1952) as well as the present one, Mercer made a total of four guest radio appearances for Peggy Lee. 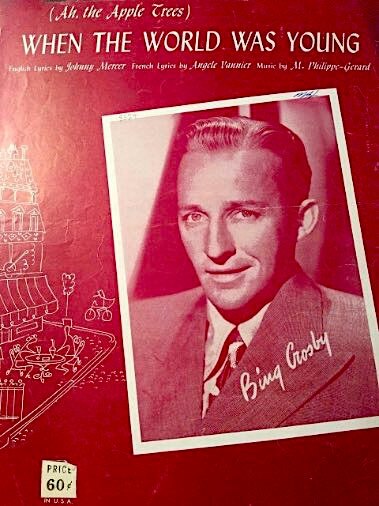 He also sang with her in other radio programs (e.g., Philco Radio Time, Starring Bing Crosby), on television (The 25th Annual Academy Awards, The Steve Allen Plymouth Show, his own short-lived TV show), and in an ensemble Capitol recording ("The Freedom Train"). As will be made clearer by the points to be discussed below, I believe that this half-an-hour episode featured more Lee performances. Regrettably, the titles of such additional numbers remain a mystery to me. This July 22, 1951 CBS broadcast is not known to be extant. Details about it are scant: the available data is circumscribed to its broadcast date and guest's name. None of my sources state which songs were performed on the broadcast, either. For those reasons, my assignment of the above-listed performances to this date must be deemed tentative, even if I believe the assignment to be sufficiently supported. A more encompassing explanation is in order. 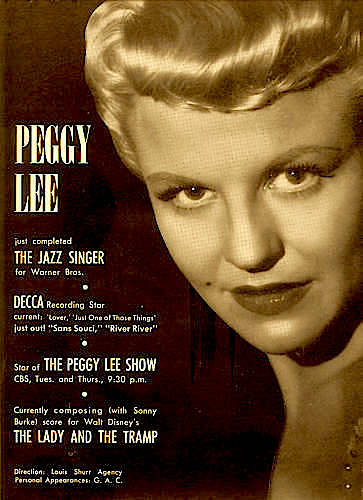 Peggy Lee hosted two radio show on CBS, the first during the summer of 1951 and the second for most of 1952. Combined, these two CBS radio series produced an approximate total of 90 episodes (7 from the 1951 season that is the main topic of this page; somewhere between 81 and 83 from the later series). Unfortunately, only a small portion of that grand total of CBS material is known to have survived till the present time. In 1953, the American Forces Radio Service acquired the contents of both CBS series. AFRS then edited, reassembled and re-broadcast them, producing -- and broadcasting, on that same year-- a grand total of 82 programs. All (but one) of these AFRS programs are currently extant, and data about their individual contents has been made available to me. After a cross-examination of the CBS and AFRS data at my reach, I have successfully paired 79 of the AFRS episodes with its original CBS counterpart. As for the three AFRS episodes left, further examination has allowed me to determine that one of them is a compilation of tracks from several of the 1952 CBS broadcasts. The remaining two AFRS episodes (numbered 63 and 64) are of pertinence to the discussion of the present session, as well as the next one. 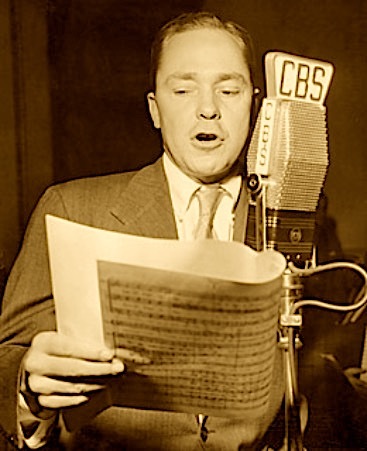 a) the shared, acknowledged presence of guest Johnny Mercer on both the CBS original and the AFRS version. b) the fact that three of the five numbers on the AFRS show ("In The Cool, Cool Of The Evening," "Go, Go, Go," "Come On-A My House") were popular and thus current in 1951. We can thus gather that the source for AFRS episode no. 63 was probably one of the CBS broadcasts from this 1951 summer installment, rather than any of the ensuing series' episodes (almost all of which have been paired with AFRS counterparts, in any case). The only fully suitable candidate is the present episode. Also worth taking into consideration is our knowledge that, while putting together its edited versions of The Peggy Lee Show, AFRS did not restrict itself to her 1952 series. In other words, we do know that AFRS made use of two other episodes from this 1951 summer season to create AFRS programs no. 82 and no. 83 (i.e., the episodes dated June 27 and July 1). 3. Peggy's Preview: "When The World Was Young"? As already stated, the contents of this original CBS broadcast are not known to me, and I have not found any indications that the broadcast has survived in full. However, there is reason to believe that the four above-listed songs constitute a portion of its contents. If so, we can only guess which other additional songs were performed during this half-hour show. We have already mentioned that each episode of this series was slated to feature a segment called Peggy's Preview, in which the vocalist would be premiered a then-fresh, brand new song. 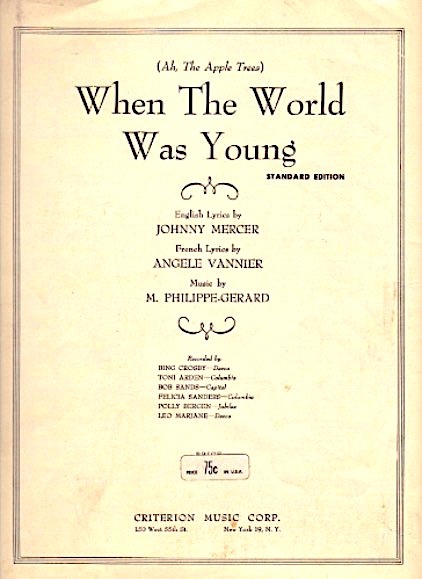 Given the presence of Johnny Mercer, one suitable choice for the episode under discussion would have been his lyric "(Ah The Apples Trees) When The World Was Young," which dates from this year, and whose debut record would be made by Bing Crosby three months later (on October 5, 1951). For the final episode of her summer radio series, Peggy Lee featured two guests, just as she had done in the very first episode. 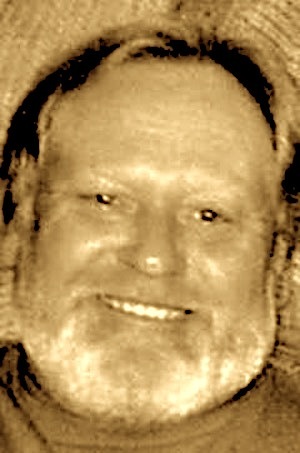 One of them was veteran stage actor Larry Douglas, seen smiling in the first of the photos above. 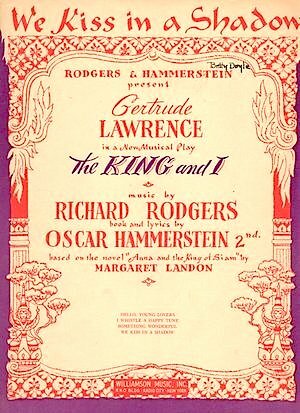 At this point in time, Douglas was performing the role of Lun Tha in the Rodgers and Hammerstein musical The King and I. The highly successful Broadway show had had its premiere on March 29, 1951 (i.e., less than four months before this guest appearance). Douglas is actually shown in costume in the two photos below, standing next to Doretta Morrow, who was playing the role of Tuptim. In the second shot, they are singing "I Have Dreamed." Lee's other guest on this episode was the future Pulitzer-prize-winning pianist Mel Powell, with whom she had cultivated a friendship which was, by then, one decade old. He had first accompanied the singer in her earliest recordings, back in 1941 and 1942, when both were members of Benny Goodman's orchestra. They would remain friends for life. The closeness of their connection can be gleaned from the fact that her 1989 autobiography quotes him verbatim and extensively. 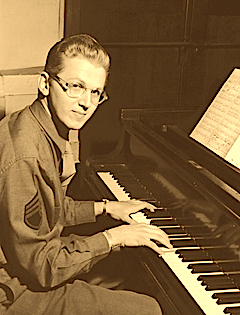 The photo of Powell seen above was taken around 1943, after the pianist had been drafted for military service. This half-an-hour episode probably featured more Lee performances that those listed above, but the titles of such unlisted numbers remain a mystery to me. This July 29, 1951 is not known to be extant. Worse yet, details about it are scant: the available data is circumscribed to its broadcast date and guest's name. None of my sources state which songs were performed on the broadcast, either. For those reasons, my assignment of the above-listed performances to this date must be deemed tentative, even if I believe the assignment to be sufficiently supported. A detailed explanation of this subject matter was given in the notes under the preceeding date. a) the shared, acknowledged presence of guest Larry Douglas on both the CBS and the AFRS Show. b) the fact that two of the five numbers on the AFRS show (Bermuda," "Mister And Mississippi") were popular and thus current in 1951(rather than in 1952), and two others ("After All, It's Spring," "Something Wonderful") were brand new in 1951. We can thus gather that the source for AFRS episode no. 64 was probably one of the CBS broadcasts from this 1951 summer installment, rather than any of the ensuing series' episodes (almost all of which have been paired with AFRS counterparts, in any case). The only fully suitable candidate is the present episode. 3. Peggy's Preview: "We Kiss In A Shadow"? As already stated, the contents of this original CBS broadcast are not known to me, and I have not found any indications that the broadcast has survived in full. However, there is reason to believe that the four above-listed songs constitute a portion of its contents. As to which other additional songs were performed during this half-hour show, we can only make guesses -- and so shall we. We have already mentioned that each episode of this series was slated to feature a segment called Peggy's Preview, in which the vocalist would be premiered a then-fresh, brand new song. 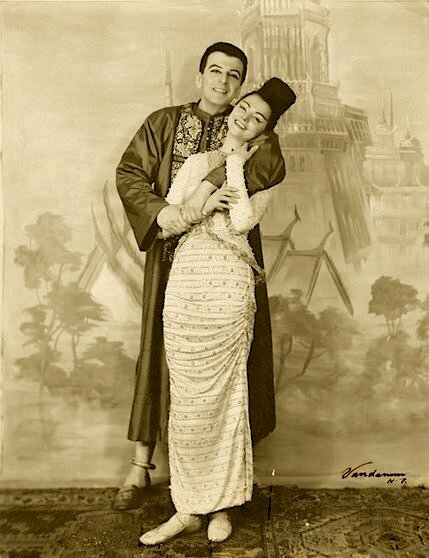 Given the presence of Douglas, a cast member from the original production of The King And I, Lee could have featured a number from that Broadway show. (And she did, by reprising "Something Wonderful." It is certainly possible, however, that the reprise served as the episode's entry under Peggy's Preview. But I'm choosing to speculate instead that she gave a try to a fresh number, too.) The main suspects would be "Getting To Know You" (which she would indeed sing in her 1952 radio series) and "We Kiss In A Shadow" (which herb guest Mel Tormé had sung in the debut episode, and which she herself would record for the World transcription service two or three years later). Other possibilities can also be entertained: "Hello, Young Lovers," "I Whistle A Happy Tune," "I Have Dreamed," and "Shall We Dance?" 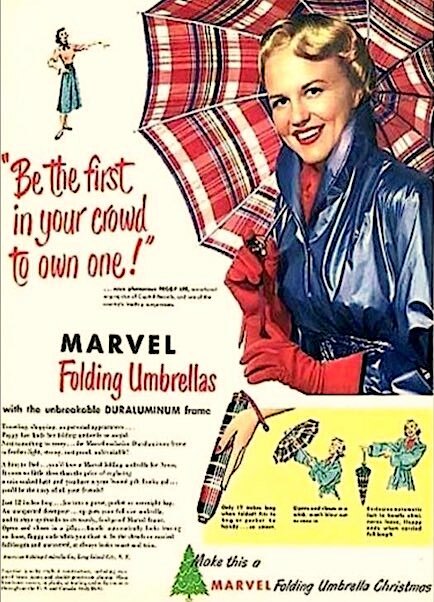 All seven episodes discussed above belong to the 1951 summer series The Peggy Lee Rexall Show, which aired each Sunday at 7:30 p.m. from June 17 to July 29 on the CBS radio network. Hostess Peggy Lee was accompanied by The Russ Case Orchestra and by announcer Bill Adams, the latter being in charge of promoting the sponsor's line of products. (Ken Niles might have replaced Bill Adams for an episode or two.) Crew members included producer Louis Melamed, director Oliver Daniels, and writer Robert Paul Smith. Beamed from the Big Apple, each half-hour episode featured one guest, who usually was somebody either from the local scene or, otherwise, someone temporarily visiting New York at that time. This one-guest per episode quota was raised to two visitors for the opening and closing episodes of the series. Only one full episode of The Peggy Lee Rexall Show (July 15, 1951) has ever been released commercially, thus becoming preserved in its full, half-hour original form (minus commercial). As for the other six broadcasts, full-song programs have been preserved in two instances -- but not the rest of either episode's proceedings. In the case of two other episodes, about half of the songs are believed to be extant, while not even the titles of the other half is currently known. 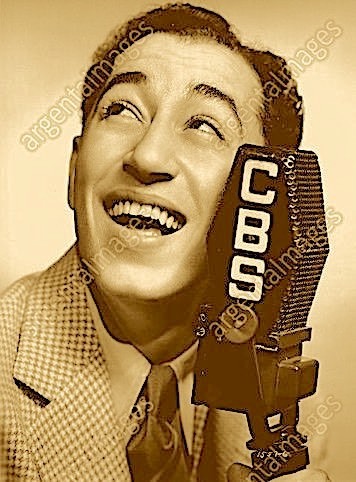 The prospects are altogether grim when it comes to the episodes broadcast on June 24 and July 8, 1951: neither has been preserved and the only additional piece of knowledge about them is the identity of their guests (Art Lund, Louis Prima). In total, 21 Peggy Lee vocals from this Rexall-sponsored show are deemed to be extant (13 of them definitely so; the other 8 are in existence but still need full confirmation that they belong to this 1951 series, rather than to the 1952 sequel). The titles of yet two additional vocals, heard on the debut episode of the series, are known; no indication that they are still extant exists, however. Besides all those vocals featuring Lee solo or alone, a handful of numbers interpreted by the various guests have been preserved as well. The show's format can be tentatively surmised from two sources: the audio of the extant episode (July 15, 1951) and a trade review of the debut episode. The proceedings would customarily begin with a few bars of "It's A Good Day," as sung by Peggy Lee. Then announcer Bill Adams would step in, uttering his introduction to the program. In the surviving episode, Adams enthusiastically recites his lines as follows: "Yes, it's the girl friend, Peggy Lee. Brought to you by the makers of Rexall drug products and ten thousand independent Rexall druggers. With Russ Case And His Orchestra, Peggy's special guest Benny Goodman -- and Benny's brought a brand new tune for Peggy and for you. You've got a date with Peggy Lee!" Throughout the episode, the volume of applause suggests that a substantial and enthusiastic audience was in attendance. The focus was on the musical selections, which packed the show. Lee seems to have sung an average of five numbers per episode, adding or subtracting one song when the rest of the proceedings (i.e., guest time, Rexall promotional spots) demanded it. Each musical selection was preceded by brief, simple but winsome commentary from the hostess. For instance: "Hello. You are right there and I'm right here. And all we are missing is a song. And in just two bars, we'll have that." Being the show's hostess, Lee presumably carried brief chats with her guests, too. This facet of Lee's hosting is expressly pointed out in the following sentence from a July 1951 article of the magazine Capitol News: "Peg will not only contribute her chirping talents to the Rexall sponsored Peggy's Review over CBS on Sunday nights but will toss the questions in the interviews and do general emceeing around the hall." Actually called Peggy's Preview, that noteworthy segment of the show was dedicated to Lee's introduction of a brand new number. The aforementioned magazine's reference to the program as Peggy's Review might be an error on the part of the magazine's reporter, or it could be an indication that the show was temporarily slated to bear that name. There is also a reference to the entire show itself as Peggy's Review in the 'Round The Wax Circle column from the July 28, 1951 issue of Cashbox magazine. 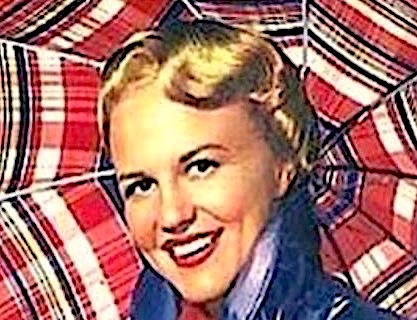 If the fully extant episode (July 15, 1951) is a good indication, the closing segment of the show was signaled by Peggy Lee's singing of the line "good health to all from Rexall," after which she would segue into a few bars of "Where Or When." Or perhaps she would not: whereas Lee's singing of the Rexall tagline strongly appears to have been standard procedure, the bars from the Rodgers & Hart standard could have been circumscribed to the available episode only. In the episode, any reference to "Where Or When" would have served as a reminder of the success which the hostess and her guest had enjoyed with that song a decade earlier, when Peggy Lee and Benny Goodman were working together on a regular basis. As to why such a relatively small quantity of episodes (seven) was scheduled, the simple reason had already been referenced: The Peggy Lee Rexall Show was a summer replacement series. During the non-summer months, its 7:30 p.m. slot belonged to the popular Amos 'n' Andy comedy series, also sponsored by Rexall. Rather than deeming it just filler for the Amos 'n' Andy hiatus, CBS' executives might have thought of the Rexall Show as part of a test to determine if Peggy Lee could carry a series to their satisfaction. Such an approach is suggested by the following report, from the June 6, 1951 issue of Variety: "[v]ocalist Peggy Lee will get a full-scale radio and television buildup by CBS during the summer. Web this week pacted [Lee] .... after having previously signed her as summer replacement for The Perry Como Show on TV ... CBS has not finalized any plans for Miss Lee for the fall, but it's expected that she'll be handed her own show on either radio or TV ..."
Lee probably passed this summer test, which also involved a television program (July-August 1951, co-hosted by Mel Tormé). CBS went on to give Lee a year-round radio series. The latter premiered in late December of 1951 and continued for the next ten months (as fully documented here). The busy singer also received a recurrent television spot (ca. December 1951 - ca. March 1952), while concurrently embarking in a movie career as both star (the female lead on the film The Jazz Singer) and songwriter (the songs for Walt Disney's Lady And The Tramp).